Per usual, you can click on the name’s above to go to the wrestler’s profile. This event aired on Stardom World, so nothing will be clipped. We start off with a rookie battle! Arisu is the old veteran of the match at the age of 15, as both Hanan and Ruaka are 12. Why Stardom suddenly decided to get a bunch of 12 year olds I have no idea, but what can ya do. Arisu debuted last summer and is actually pretty good, while Ruaka debuted in the fall. Hanan just debuted a few weeks ago, and this is her second match. So we go in with low expectations. They start with a triple knuckle lock, double Irish whip to Arisu but she avoids both her opponents dropkicks. She isolates Ruaka but Ruaka gets her to the mat in a headscissors, Arisu gets out of it and Hanan grabs Ruaka from behind. Ruaka takes down Hanan too but Hanan kips up and all three are back on their feet. Hanan is double teamed, which doesn’t seem fair, until Hanan hits a judo throw on both of them. Ruaka kicks Hanan but Hanan kicks her back and tosses Ruaka to the mat. This leaves Hanan alone with Arisu, Arisu pushes her against the ropes and she puts Hanan in a crab hold. Ruaka breaks it up and hits a reverse STO on Arisu, covering her for two. Hanan goes off the ropes and dropkicks Ruaka and then Arisu, another dropkick by Hanan but Ruaka breaks up her cover on Arisu. Ruaka stomps Hanan and throws both Hanan and Arisu in the corner, big boot by Ruaka and she hits a fisherman suplex hold on Arisu for a two count. Ruaka picks up Arisu but Arisu dropkicks her in the leg, Arisu puts Ruaka in a leg lock but Ruaka gets out of it. Arisu dropkicks Ruaka out of the ring, she picks up Hanan but Hanan sneaks in an inside cradle for two. Elbows by Hanan but Arisu dropkicks her in the corner and she nails the Blockbuster for the three count! Arisu Nanase is the winner. This was actually better than I was expecting. For a 15 year old and two 12 year olds, the match was shockingly smooth with really nothing awkward or out of place. It was simple of course, but pretty well done. Hanan and Ruaka are too young to know if they will turn into stars down the road, but no red flags yet anyway. Good rookie opener. Even though Kris is the High Speed Champion coming into the match, the title is not on the line here. Kris won the title back in February, she has really stepped up her game lately and has grown into a pretty good wrestler to go along with her carefree character, she always has so much fun in the ring and it shows. Kaori normally manages the rookies but she steps up a bit here to try to show Kris that she is more than just a babysitter in Stardom. After kicking off the match with a high speed exchange (Kris is the High Speed Champion after all), Kris goes to run off the ropes but Kaori grabs her by the tail and ties it to the bottom rope. Not the first time this has happened to Kris and a definite downside to having a tail. Kaori puts Kris in a bodyscissors, stomps by Kaori but Kris hits a spinning headscissors before delivering a running knee. Kaori elbows Kris off and the two trade blows, kick to the chest by Kris but Kaori bridges out of the pin and hits a running knee of her own. Senton by Kaori, and she covers Kris for two. Kaori picks up Kris and tosses her into the ropes, but Kris hits a rebound crossbody for two. Running knee by Kris in the corner, she flings Kaori to the mat before kicking her in the back for a two count cover. Kris picks up Kaori but Kaori elbows her off, she goes off the ropes but Kris catches her with a suplex. Kris gets on the second turnbuckle but Kaori avoids her dive and knees Kris in the back of the head. Kaori gets on the second turnbuckle herself and delivers the diving senton, cover by Kaori but Kris gets a shoulder up. Kaori picks up Kris but Kris blocks the suplex, Kaori goes for the Chaos Theory but Kris hits a sunset flip for two. They trade flash pins before Kris boots Kaori in the chest, roll-up by Kaori but it gets a two count. Delayed Chaos Theory by Kaori, and she picks up the three count! Kaori Yoneyama is your winner. Action-wise this was fine, but I am not really sure why it existed. Kaori is already above Kris on the pecking order due to her veteran status, so she didn’t need to pin her to earn herself a title shot. It just re-established what we already knew. Pretty short and without a reason to care, even though Kris is always fun to watch. 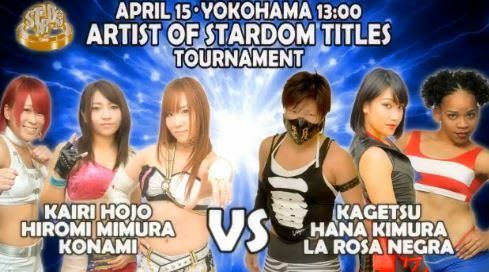 This match is part of the Artist of Stardom Championship Tournament Semi Final. Hiroyo and Kyona are a regular tag team and come into the match the Tag Team Champions, while Natsuko is an older rookie that hopped aboard since they needed a third person. Io Shirai is the leader of Queen’s Quest, a faction that includes HZK and AZM, and two of them (Io and HZK) were the last two to hold the Artist of Stardom Championship. Both teams have inexperienced and/or young wrestlers (Natsuko and AZM, respectively) so its anyone’s game. HZK and Natsuko begin the match and start trading elbows, Natsuko goes off the ropes but can’t shoulderblock HZK over. She finally succeeds in doing so, but HZK comes back with a dropkick and tags in AZM. AZM pushes Natsuko into her own corner so she tags in Hiroyo, AZM elbows Hiroyo with no luck as Hiroyo absorbs all her blows, dropkick by AZM but it has no impact either. Hiroyo kicks AZM but AZM bridges out of the pin, AZM goes for a crossbody but Hiroyo catches her and hits a backbreaker. Scoop slam by Hiroyo and she tags in Kyona, who also slams AZM to the mat. Natsuko returns as they take turns on the child, Hiroyo gets AZM on her shoulders and spins her into HZK before throwing her at Io. HZK recovers and helps AZM get Hiroyo down long enough for her to get to the corner to make the tag to Io, Hiroyo elbows Io but Io slides out of the ring and trips her. Slingshot dropkick by Io, Kyona and Natsuko come in but Io dropkicks both of them. Missile dropkick by Io to Hiroyo as she manages to clear the ring, she puts Hiroyo in a crossface but Hiroyo gets to the ropes for the break. Hiroyo grabs Io and gets her on her shoulders, gutbuster by Hiroyo and she goes off the ropes, but Io hits a hurricanrana for a two count. Io kicks Hiroyo in the face but Hiroyo hits a backdrop suplex, leaving both wrestlers down on the mat. Io tags in HZK while Kyona is also tagged in, HZK elbows Kyona into the corner but Kyona puts HZK in a sleeper. Kyona swings HZK around while keeping her in the hold, Natsuko runs around the ring to stop AZM from interfering but Io recovers and breaks up the submission. Kyona hits a crossbody on both of them and tags in Natsuko, sentons by Natsuko to HZK but AZM runs in. Natsuko drop toeholds AZM onto HZK, senton by Natsuko and she covers HZK for a two count. Side Russian Leg Sweep attempt by Natsuko but HZK blocks it, Io and AZM run in but so do Kyona and Hiroyo. Hiroyo and Kyona lariat both HZK and Natsuko to help her (which wasn’t incredibly helpful), they nudge Natsuko out of the way and Kyona hits a diving body press onto HZK. Diving senton by Natsuko, but Io breaks up the cover. The ring clears as Natsuko picks up HZK, swandive missile dropkick by Io to Natsuko, and HZK covers Natsuko for two. HZK picks up Natsuko and hits a full nelson slam, AZM comes in but Hiroyo grabs her from the apron. Io and HZK get rid of Hiroyo and Kyona, they triple team Natsuko before HZK nails the Bombs Away for the three count! Queen’s Quest wins! This match is part of the Artist of Stardom Championship Tournament Semi Final. On one side, we have the rest of the members of Oedo Tai, led by Kagetsu (I think). The other team at the time of the match referred to themselves “The Chibis” but they aren’t a real regular trio. The popular Kairi does team sometimes with Hiromi or Konami, but they aren’t a faction in the same way that Oedo Tai is. 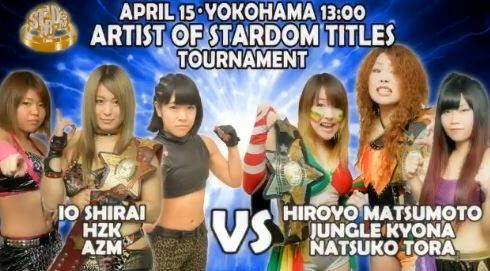 I expect some cheating and shenanigans here, but it should be a fun contrast as the squeaky clean babyfaces and the dastardly Oedo Tai face off. The Chibis charge their opponents to start the match, as the action spills out to the floor and onto the apron. They stay in control for a few minutes, Kairi gets on the top turnbuckle and dives out onto all three members of Oedo Tai as The Chibis stand tall. Back in the ring they gang up on Kagetsu, Kairi chops her into the corner and hits a running shoulder tackle. Kairi tags in Hiromi, elbows by Hiromi but Kagetsu switches positions with her and chokes Hiromi in the corner. Hiromi dropkicks Kagetsu and hits a low crossbody before tagging in Konami. Knees by Konami and she kicks Kagetsu repeatedly in the back, she goes off the ropes but Hana trips her from the floor. Now it is Konami that is triple teamed for a bit, Kagetsu stays in with her and makes the tag to La Rosa Negra. La Rosa Negra drives Konami back and forth into all the corners before slamming her to the mat, cover by La Rosa Negra but Kairi breaks it up. La Rosa Negra charges Konami but Konami kicks her back and applies a hanging armbar, missile dropkick by Konami and she covers La Rosa Negra for a two count. Konami rolls up La Rosa Negra and applies an ankle hold, but it is broken up by Hana and Kagetsu. Fisherman suplex hold by Konami to La Rosa Negra, and she tags in Hiromi. Elevated DDT by Hiromi, she goes off the ropes but La Rosa Negra catches her crossbody attempt, spinning spinebuster by La Rosa Negra but Kairi breaks up the pinfall. La Rosa Negra tags in Hana, Hana stomps Hiromi and hits a jumping double knee in the corner, cover by Hana but it gets two. Hana goes for a suplex but Hiromi blocks it, boot to the head by Hana and she hits a vertical suplex. Hana kicks at Hiromi but Kairi and Konami run in and both dropkick Hana. Sliding Kick by Konami followed by a Sliding D by Kairi, La Magistral by Hiromi but Kagetsu breaks it up. Konami and Kairi dropkick La Rosa Negra and Kagetsu out of the ring, Hiromi picks up Hana and elbows her but Hana elbows her back. Dropkick by Hiromi and she tags in Kairi, Kairi goes up top and she hits the diving elbow smash. Kicks to the back by Kairi and she puts Hana in the Ikari, but Kagetsu breaks it up. Kairi slams Hana in front of the corner and goes up top, but Kris Wolf grabs her from the apron to slow her down. This gives Hana time to recover, and she tosses Kairi back onto the mat. Spinning chop by Kairi to Hana, she goes off the ropes but Kagetsu hits her from the floor with a piece of luggage. Kagetsu comes in with a chair and hits Konami with it, she then goes to Kairi and whacks her in the head with the chair. Ebisu Drop by Kagetsu to Kairi, then La Rosa Negra comes diving off the top turnbuckle with a diving body press. Big boot by Hana, and she covers Kairi for the three count! Oedo Tai wins! Something was missing here, and I couldn’t quite put my finger on what it was. Some parts I really enjoyed, as Hana is a pleasure and Kairi tends to make everything she does interesting since she fights with so much emotion. But La Rosa Negra didn’t really fit in well, and when Hiromi isn’t in a match with comedy elements she tends to fade into the background. They needed all six here of course since it was a tournament, but Kagetsu/Hana vs. Kairi/Konami would have been a much tighter match. A bit too loose and meandering for my liking, although it was still better than average as they kept the pace up and it was too short to be offensive. We get a break from the tournament for a match featuring mostly a Gaijin battle, with a little bit of Mayu sprinkled in too. This is Havok’s first tour in Stardom and my first time seeing her in Japan, she has been wrestling since 2004 and is a regular in Ring of Honor. Tessa is back after touring for Stardom last summer, she is only three years into her career and wrestles in various promotions around the Indie circuit. Hetzza is on her first Stardom tour as well, she is a luchadora from WWS who I don’t know a whole lot about, and her partner Mayu is of course one of the most popular wrestlers in Stardom but currently title-less. Havok and Mayu begin the match for their teams, with Havok throwing Mayu around like a child. Mayu thinks she has a good strategy as she dropkicks Havok in the leg but Havok shrugs it off. Mayu is scared so she tags in Hetzza while Tessa is also tagged in, they trade strikes awkwardly until Tessa knocks Hetzza to the mat. Tessa puts Hetzza in a stretch submission hold, she picks her back up and tags in Havok. Havok picks up Hetzza, Hetzza goes for a crossbody but Havok catches her and puts Hetzza in the Tree of Woe. Havok elbows Hetzza in the chest before tagging Tessa back in, Tessa drops Hetzza in the ropes and dropkicks Hetzza in the back. Running elbow by Tessa but Hetzza punches her and tags in Mayu. Mayu runs off the ropes and elbows Tessa, Tessa elbows her back but Mayu grabs her wrist and hits a triple jump split-legged armdrag. Dropkick by Mayu while Tessa is against the ropes, and she covers her for a two count. Mayu picks up Tessa, she drops her over the top rope onto the apron but Tessa lands on her feet and slides back in the ring quickly to hit a German suplex. Tessa tags in Havok, Havok picks up Mayu and press slams her to the mat. Mayu goes for a sunset flip but Havok blocks it, she tries to sit on Mayu but Mayu moves and kicks Havok in the head. More kicks to the head by Mayu, and she covers Havok for a two count. Mayu tags in Hetzza but Havok mushes her to the mat, kick by Havok and she scoop slams Hetzza for two. Mayu comes in but so does Tessa, Havok suplexes Mayu while Tessa hits a Codebreaker onto Hetzza. Tombstone Piledriver by Havok to Hetzza, and she picks up the three count! Tessa Blanchard and Havok are the winners. Oh man. This match. I don’t like to bury people the first time I see them, but Hetzza is clearly way out of her element. She is green, which we knew, but I have to assume she is used to working with the same few people in the same style as she looked completely lost here. The strike exchanges and everything else she did just looked awkward. I’m not giving up on her, hopefully with some practice in the dojo over the next few months she gets better. That overshadowed the match, but Havok and Mayu had some good exchanges and Tessa looked better here than she did last summer. Still, a skippable match overall as some parts were just painful to watch. This match the Artist of Stardom Championship Tournament Final. This isn’t a surprise, as the two real factions face off to crown the new Trios champions. Neither team are “good guys” but Queen’s Quest is the lesser of two evils as while they are cocky they don’t usually cheat to the extent that Oedo Tai does. Io is the best wrestler in the match but she also has the youngest wrestler on her team, as AZM is always susceptible to being pinned at any point. So there will be multiple things going on at a time, as Io not only tries to get her team the belts but has to protect her two younger teammates. Kagetsu and AZM kick things off, Kagetsu hits an armdrag but AZM dropkicks her back and both wrestlers kip up. AZM tags in Io, Io throws Kagetsu into the corner but Kagetsu flips her onto the apron and Io falls to the floor. Hana throws Io around on the floor and into the crowd, she does this for several minutes before Io is finally rolled back in. Kagetsu picks up Io and hits a dropkick, she covers Io with one foot for a two count cover. Io is attacked by all the Oedo Tai members on the apron, Kris gets the rubber band and snaps it back into Io’s face. Hana puts Io in a Muta Lock but the referee forces her to break it, Hana tags in La Rosa Negra and La Rosa Negra stomps on Io in the corner. Kagetsu is tagged in but Io trips her, she crawls to her corner but Kagetsu cuts her off and stomps on her. Elbows by Kagetsu but when she goes for a triple jump dropkick she instead is dropkicked by Io. This gives Io time to tag in HZK, elbows by HZK and AZM comes in too to help clear the ring of Oedo Tai. All of Queen’s Quest put their opponents in submission holds, they release the holds after a moment and HZK boots Kagetsu in the corner. Codebreaker by HZK, she goes off the ropes but Kagetsu catches her with a Samoan Drop and both wrestlers are down on the mat. Kagetsu is up first, she picks up HZK but HZK boots her in the face and hits a second one, she inches to her corner and tags in Io while Kagetsu tags in La Rosa Negra. La Rosa Negra tosses Io in the corner and hits a series of hip attacks, cannonball by La Rosa Negra and she covers Io for two. La Rosa Negra picks up Io but Io elbows away from her, Io goes off the ropes but Hana grabs her from the apron. HZK grabs La Rosa Negra but La Rosa Negra gets away from her, she comes in with a chair which distracts the referee while Kagetsu hits Io with the piece of luggage. Hana goes up top and hits a missile dropkick, La Rosa Negra picks up Io and hits a spinning spinebuster but the cover is broken up. La Rosa Negra goes up top but Io avoids the body press, they trade elbows as they get up but HZK kicks La Rosa Negra from the apron. German suplex hold by Io, but it gets a two count. Io positions La Rosa Negra so Queen’s Quest can do an AZM-assisted splash on La Rosa Negra, roll-up by Io but it gets broken up. HZK and Kagetsu come in with Hana, Hana tries to hit HZK with the luggage but she hits Kagetsu by accident. Running double knee by Io in the corner to La Rosa Negra, she tries to go up top but La Rosa Negra grabs her leg. Io gets the piece of luggage from her and hits La Rosa Negra in the head with it, Io goes up top and she nails the moonsault for the three count! Io Shirai, HZK, and AZM are your new champions! Since Trios matches aren’t usually my cup of tea, I went in without the highest of expectations but still came away a bit disappointed. The tournament itself was above average, with one standout match, but the matches around it did nothing to contribute since almost all the best wrestlers were in the tournament itself. Some decent action, but nothing must-see and overall not a show I’d recommend to more casual Joshi fans.